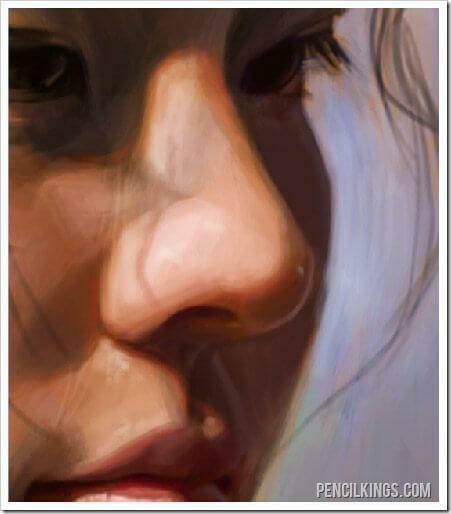 Here’s a look at the finished image for this lesson on skin color values in Photoshop. 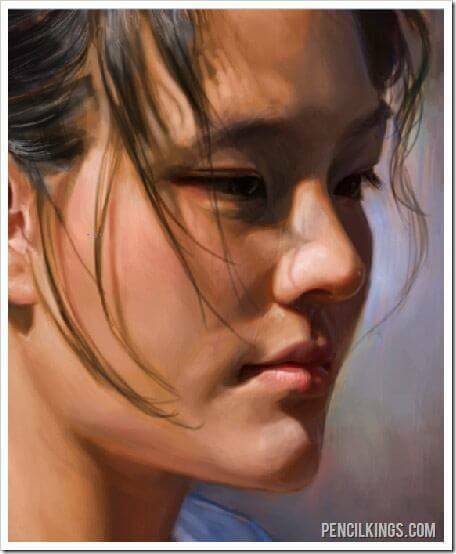 If you are familiar with traditional painting you have heard of the concept of using North Light in your works. 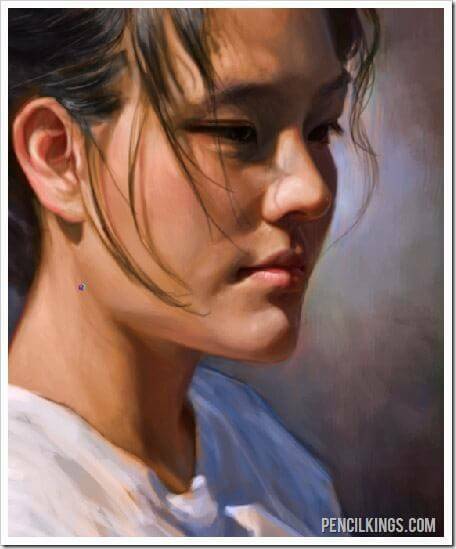 To explain this term, classically trained painters use a high, north facing window to get a naturally cool lighting on their subject. The reason for this is that you will not get direct sunlight, but will instead get more natural, indirect lighting for your subject coming from the north. This cool north light will give warm shadows to your subject. The rule is that cool lighting will give warm shadows and warm lighting will give cool shadows. Warm means that it’s closer to reds, oranges and yellows, while cool means that it is closer to purples, blues and greens. You can also have warm blues and greens, but that just means that they are shifted closer to yellow and red. 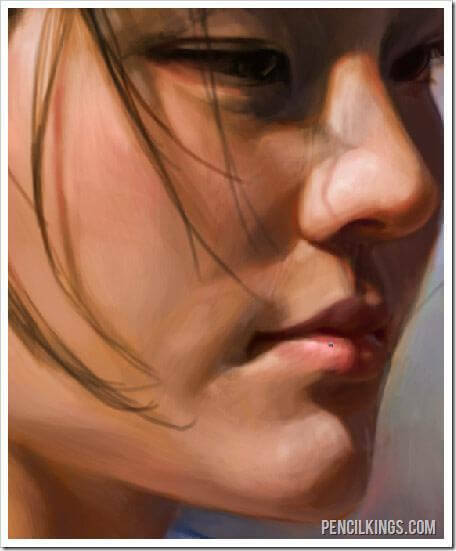 One of the advantages of digital painting is that you are really free to use whatever lighting scheme you want. 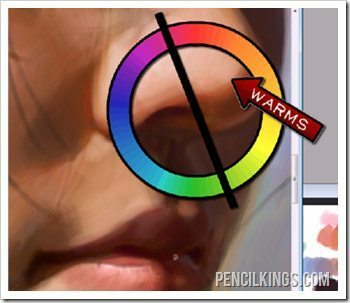 However, if you are trying to achieve a look that closely resembles traditional painting like in this lesson on skin color values in Photoshop, it’s best if you are familiar with how lighting is often used in traditional media. 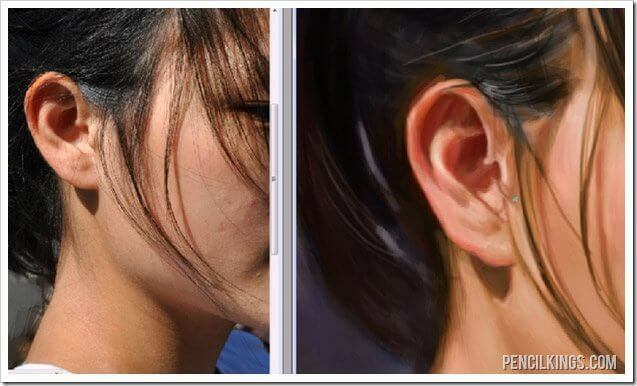 As professional artists progress, there is often a trend where their understanding of art and the old masters increases, and they work to emulate these styles and techniques in their digital work. One of the key messages in this video is the need to keep practicing and learning. 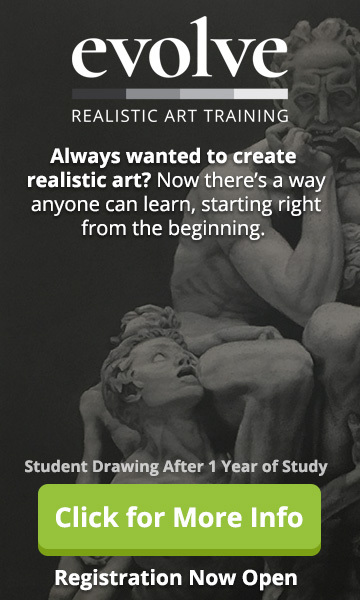 Becoming even a good artist isn’t something that happens overnight. 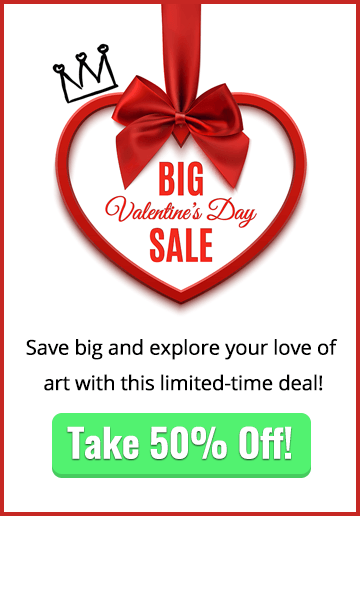 We’re all born with a certain level of skill at holding a pencil or brush and applying marks to a page, but it’s the ongoing dedication to this craft that will make the biggest difference in your ability as an artist. The important thing to take away from that last sentence is that practice will overcome raw talent every time. This applies not only to art, but to almost everything in life. The difference between the good and the great is the sheer amount of time that someone has spent honing their skill. 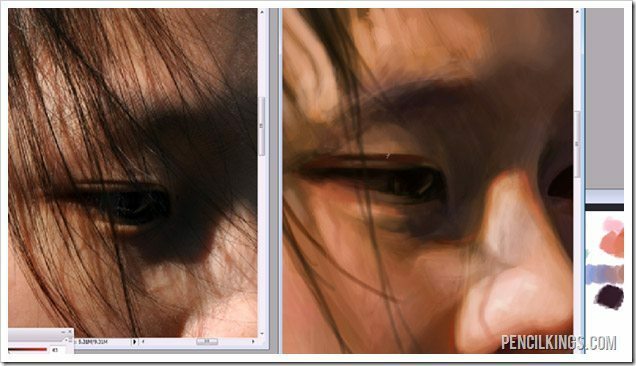 So, when learning about skin color values in Photoshop, be sure to dedicate some time each day to your art. 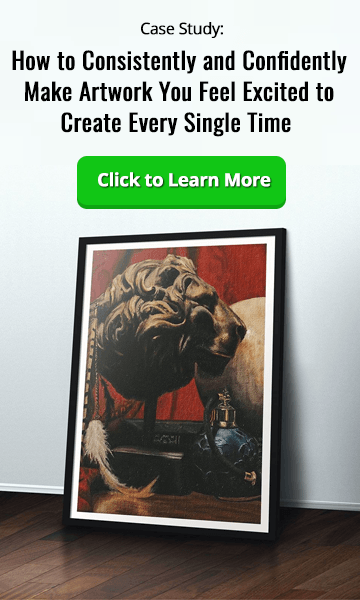 One thing that you could to do really see a remarkable advancement in your ability is to commit to drawing once every day. It doesn’t matter how long you draw, the most important thing is that you do it every day. Some days you may not feel inspired to draw, so just spend five minutes and then call it quits. Other days you may find yourself not wanting to draw, but by just forcing yourself to start you will soon find that your enjoyment for drawing has come rushing back to you, and two hours will pass before you even think about looking at the clock. Once you have finished your drawing for the day, make sure to put a date on it so that you can keep a visual journal of your life. One of the keys to always improving is to focus on those areas that you are uncomfortable with drawing. Take this ear for example – you’ll see Sycra spending a lot of time detailing it. It’s not uncommon to see artists work where they don’t put very much detail into an area. 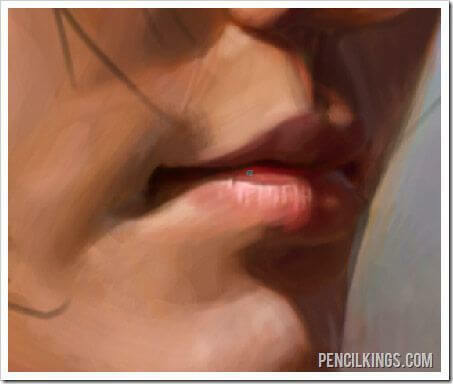 As you improve as an artist you need to strive to have the ability to put detail if needed, into all areas. Force yourself to draw through your problem areas, and before you know it, you’ll start to find that those parts of the face won’t be giving you the headaches they did before. 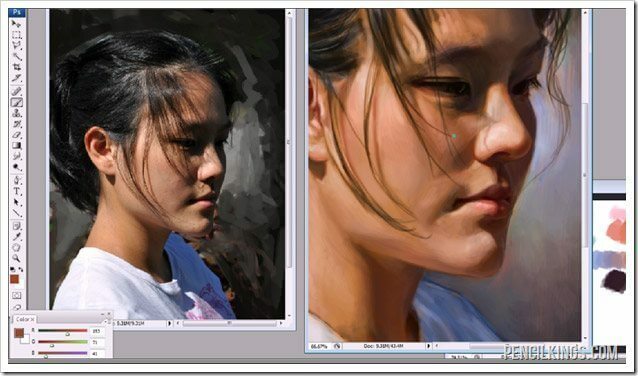 We hope you enjoyed this article on skin color values in Photoshop. See you in the next tutorial!